Dogs make amazing companions, especially when we get to take them on adventures with us. Dogs love being with their humans whether they are walking, hiking, on the water or in the mountains. Going hiking, backpacking, or camping with a dog can be an enriching experience for the both of you. your hiking experience with Fido! The key to having a great outdoor adventure with your dog is to be prepared and to do these things safely. While the whole thing can seem like a lot of fun, there are several hazards that dog owners should be aware of before taking their dogs with them on a camping, hiking, or backpacking trip. We can't emphasize strongly enough the importance of pet insurance for your pupster. It doesn't matter if you're a novice hiker or a pro at trekking with your dog in rough terrains, accidents do and will happen and in particular in water sports like dog kayaking or boating with your dog. Having basic accident only pet insurance will go a long way against a large vet's bill. Not many pet insurers have that option but PetPremium is one of the few out there that offers protection against accidents. Personally I have full coverage for my Golden, but you can start with their basic policy since by itself it can cover many things including broken bones and poison indigestion. These two are most popular when hiking with your dog. Taking your dog camping, hiking, or backpacking can be a lot of fun! 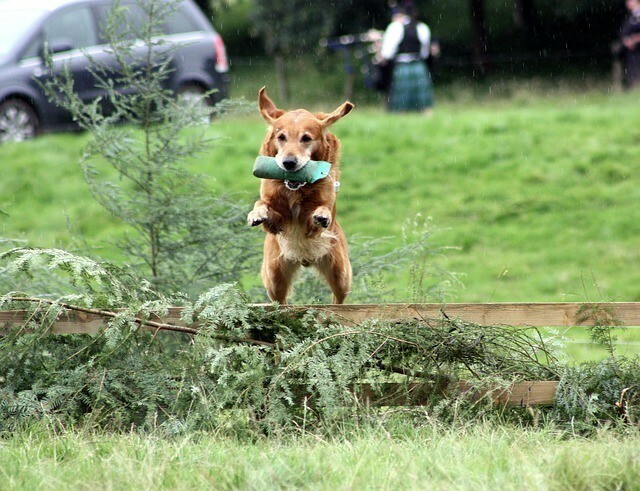 Dogs love the adventure, especially if you have a high energy working dog. The only thing is that being out in nature like this can be a lot of excitement for a dog, so they should be trained well before you take them out with you. You don’t want your dog taking off at the sight of a squirrel and not responding to you when you try to call them back. Your dog should know its name, respond to being called, and understand other basic commands like sit, stay, and lay down. These commands can help you if you come across other people and animals and are helpful because there are certain rules and etiquette (see our tips below) when it comes to taking dogs with you on a camping or hiking trip. Your dog should always be supervised and if their obedience isn’t good you should keep your dog on a leash. When planning a longer trip, dogs should actually train so that they are physically ready. It is also safest to consult with your vet before taking your dog on a trip to make sure that there are no health issues that you should be concerned about. 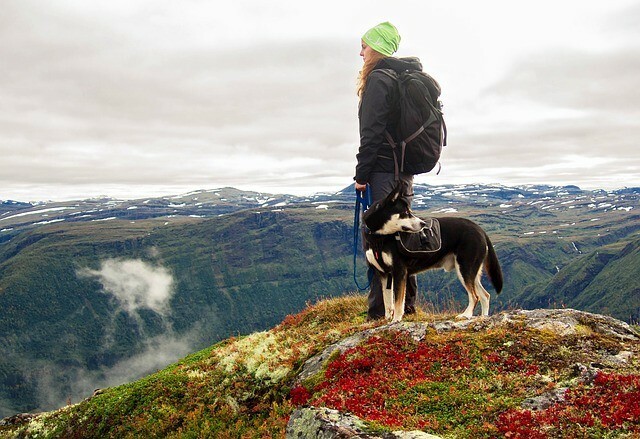 Asking whether your dog is ready for hiking is something you want to be very honest about. But with the right preparation and mind-set a lot can be achieved. Hiking in particular best suits breeds that are generally active for around a minimum of 7 hours a day. So, be realistic about your pup’s capabilities and endurance levels. Of course if your dog was a naturally high-energy bird hunting dog with a natural instinct to chase wildlife and is friendly and likes people, then that’s half the battle. With less active dogs, preparation is key. Start building up your dog’s endurance a couple of weeks to a month before of a camping trip/hiking trail. Their paws, joints and endurance will slowly have to be built up. Train them to respect the surrounding wildlife, other dogs, hikers and gear. Ticks: Start applying a monthly tick treatment like Seresto and checked your dog multiple times a day. Bring along a tick key and tweezers and be prepared to remove ticks on a daily basis. Gear: Train your dog to start carrying his own gear in a backpack to help lighten the load. Consider letting him carry his first aid kit, some of the food, supplements and bowls. Taking care of a dog on the trail is hard work so training your pooch proper trail etiquette will save you a lot of unnecessary hassle. Here’s a few basic tips to ensure the adventure remains enjoyable for both you and your dog. Leash your dog: If hiking, when coming in contact with you other people have your dog on a leash. Keep your dog out of other people’s belongings: Don’t let your dog rummage other people’s gear or eat other people’s food. Safety first! 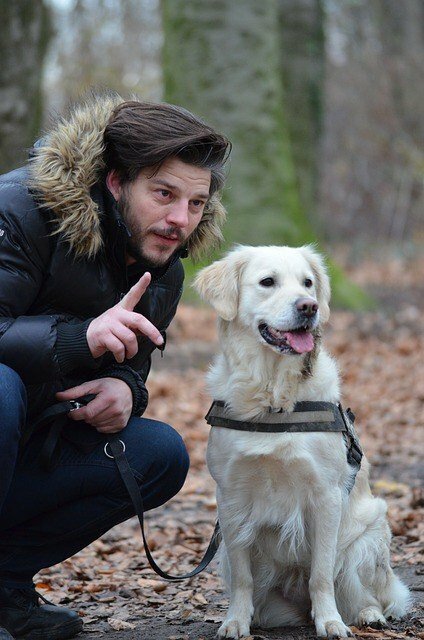 Be respectful of others: Since some people have allergies or fear of dogs, keep your dog on a leash and make it your policy to seek permission first before letting your dog approach another person. Packing for a trip with your dog is essential. The trip will go a lot smoother if you remember to account for all the essentials, including: poop bags, water, and food. Make sure that your dog’s water is clean and fresh. It is generally recommended that you keep your dog on the same food as they usually eat while you are away. Start with the portions you are used to feeding them and adjust by giving them a little bit more to account for the energy they are using. When preparing for camping and backpacking trips, remember to bring a towel and brush. This way, you can clean and dry your dog before you let them into your tent or other shelter for the night. Keep your dog’s nails clipped to protect your tent from holes. In terms of your tent, you should plan on it being one person larger to accommodate your dog. So, if you are one person with your dog, use a two-person tent or larger. For a couple and a dog, a three-person tent. Make sure you also check out our article on the ultimate guide to buying guide a dog sleeping bag - a must have dog camping gear item. Great for large dogs between 75 -120 lbs. If possible, try to do a couple of test runs and sleep outside in your yard with your dog. This will help them get familiar with the sleeping arrangement so they won’t freak out if it is their first-time camping with you. Be sure to pack a warm dog bed and blanket for cooler nights. tweezers for tick removal packed with you for your trip. Know how to clean and take care of wounds and apply liquid bandage to cuts on your dog’s paws to keep them sealed and clean. Check your dog for ticks nightly, especially if you have been in long grass and bushy areas. There are several other products you can use as tools to help keep your dog safe and comfortable during your outdoor adventures. Many people recommend using a light-up collar, or other clip on lights at night so you can see where your dog is always. Dog booties can be helpful depending on where you are hiking, since some surfaces can be hot or painful for your dog’s paws, a coat for cold weather is always a good idea, and cooling collars are great for making sure your dog doesn’t become overheated on a really hot day. If you have a larger dog who is in good shape, you can also use dog packs to have them carry some of the weight on a backpacking trip. Here is a helpful guide on how to measure your dog for a dog pack. Having a safe and happy trip with your dog means finding a place that is dog friendly. 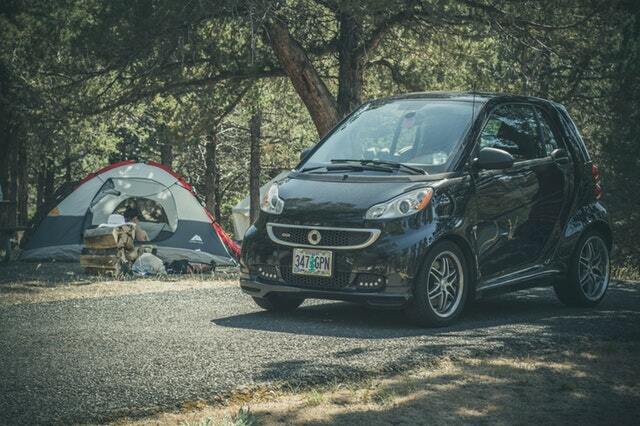 Find places that are easy on the paws for hikes. This means avoiding areas known to have a lot of sharp rocks and too much heat where paws can get burned. Shady areas are best so dogs don’t overheat, and you will want to avoid being around steep drops or places with a lot of horses and mountain bikes that could easily trample or scare a dog. Keep your eyes open to these small details and do your research so you know about potential hazards, like poisonous plants, and what to do about them. Once you become familiar with different trails and camping sites you will find some that are your favorites to comfortably explore with your dog and gain confidence taking them out with you. The first thing to do is to decide on the type of camping that will suit you and your dog’s personality and temperament. Not all dogs do well being around other animals or have a hard time with noise or travelling by car. 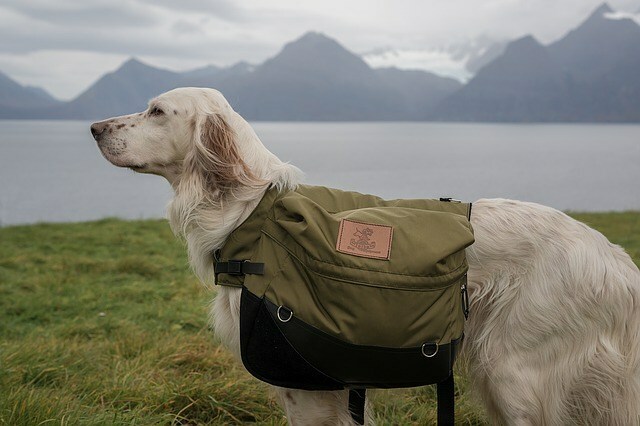 Preparation is key here, putting in the effort and spending time preparing your dog for the adventure ahead means you can go just about anywhere. Deciding where to go is seeking out places where your dog is welcome. For your pupster's ultimate comfort during those trekking or camping trips (or afternoons playing in the backyard) set up the Parkland Pet Portable Playpen, a super lightweight, easy to assemble portable tent. It sets up as easily as opening an umbrella and comes with rain fly and ventilation panels. After you both catch your breath and emerge from the rough terrain, woods or meadows carefully and quickly check your pupster for any unwanted hitchhiking insects. You certainly don't want to let any uninvinted guests or a bad dose of itch-scratch back in your home with you. So use a fine-toothed flea comb and comb on his/her coat, peer into the ears, between toes (seed ticks likes those cramped little spaces) and eliminate any ticks they picked up along the way. So, all set to enjoy Mother Nature with Fido? Camping and hiking with dogs can be a lot of fun. They have so much energy and unconditional love, they make great travel companions. You just want to make sure that your dog is ready to go on this trip by taking them to the vet and having them physically trained to handle the hiking and time outdoors. Pick your location wisely and be prepared with everything you need packed. Have plans incase anything goes wrong. Bringing an untrained dog on a trip outdoors means a lot of unexpected things can happen. Do your best to make sure your dog responds to basic commands and keep them well-supervised while you are hiking, camping, or backpacking together. 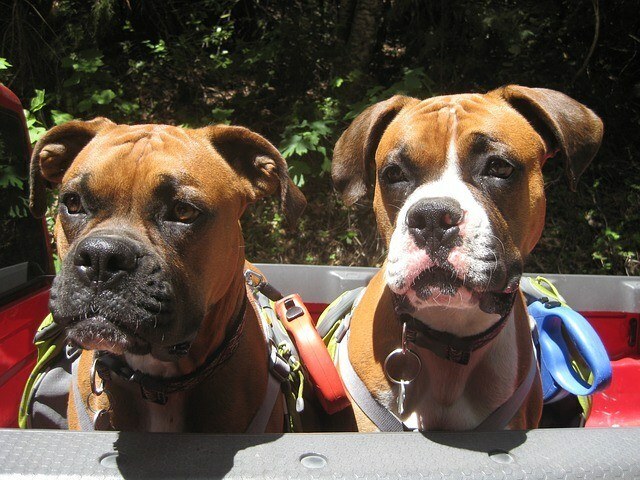 Have you been on any great dog camps or hikes that you would like to share? We would love to hear your experiences in the comments below. This post is very helpful, thanks for it.